Upon hearing a few years ago that Ridley Scott was going to make a new “Robin Hood” movie that would differentiate itself from all its predecessors, my curiosity was awakened, but so too was my scepticism. The proposed plot, however, seemed to attract me. The film was to be called Nottingham, and the script acquired by Universal Studios depicted a heroic Sheriff of Nottingham, and a thuggish and anarchic Robin Hood. The idea of the anti-hero, the change in the story, and the humanisation of a traditional villain seemed intriguing. Even more so, when Russell Crowe was reportedly given the role of the troubled Sheriff, tormented by inner conflicts and torn between his allegiance towards a corrupt king or an anarchic outlaw, who is coincidently courting the woman he too loves, I was thrilled. Scott’s dissatisfaction with the script led him to delay filming, and during 2008 it was rewritten into a story about Robin Hood becoming an outlaw, with the position of being Sheriff as part of the story. Scott dropped the latter notion and Nottingham was renamed to reflect the more traditional perspective of the hooded hero. That was the first mistake Scott made. The complexity of the Sheriff of Nottingham’s friendship with King Richard and torn motives once King John is given the throne, and is gradual despise and eventual confrontation with Robin Hood, after seeing the outlaw sweet talk the girl he desires contrasts with the flatness of some of the characters in the final version of the film. After watching the trailer, I couldn’t help but consider the film as Gladiator with a bow and an arrow; however that may be too harsh on the year 2000’s Academy Award winner. Regardless of the stale ratings the film was receiving from its critics, I decided to give Ridley Scott a chance, and enthusiastically went for a night in the movies. Ridley Scott has always been a bit of a moody prat. It doesn’t mean that I do not regard him as a phenomenal actor, but he is somebody who you know you wouldn’t try to stop him in the street to have a picture taken with him if you ever wandered past him. His recent history of tantrums has certainly done little to favour his image. After brawling in 2002 with the director and producer of the BAFTAs, Malcom Gerrie, after his acceptance speech was cut whilst he read a poem in dedication to Richard Harris, who was terminally ill, (it is said that it may have been cut due to copyright infringement or lack of time), he then returned to the headlines in 2005 after he was arrested for second-degree assault, after throwing a telephone to a hotel employee in an anger spurt. So you could imagine the look on Mark Lawson’s face as he gradually observed Crowe’s expression getting tenser as he tried to ignore the fact that he had just been mocked on air. Despite attempts to resume the interview, Crowe can’t seem to get his around the comment and opts to walk away from the studio, complaining that he couldn’t understand the comment on his accent. To be respectful, Russell Crowe certainly tries to use a regional accent with some success. Since the film portrays that Robin was not actually from Nottingham, and legend says he may have come from anywhere between Nottinghamshire and Yorkshire, Crowe was taught an accent where he had to shorten the vowels and make them flat. Nonetheless, it is obvious that Crowe put a lot effort in trying to sound like a regional Englishman, unlike Kevin Costner; however, now and then he did have that Irish tinge that made him sound more like Father Ted than Robin Hood. I had this on my mind as I approached the cinema, and unfortunately, I couldn’t get that thought out of my head throughout the duration of the movie. As the lights went back on after two hours of twenty minutes, the faces around were somewhat perplexed. It wasn’t that the plot had been confusing; it was just that perhaps they had all expected something more. However, I went to the cinema knowing that I wasn’t going to witness a great blockbuster, or a production that could have moved me half as much as Gladiator. Despite that though, I did expect Ridley Scott to woo us with a great narrative pulse, dazzling action scenes mixed with serious emotive refuges where we could see behind Robin Hood, into his troubles, his traumas and his deep persona. I did not expect the movie of the year, but I did hope to see something spectacular. During the film, I could see small hints of what I had hoped for seeping through, but never enough to leave me satisfied. Robin’s few childhood flashbacks seemed stale and did not give too much into his persona, and even though many may believe that this was done to add more mystery into a character who, after all, is a legend, I was not enticed in any way by this Robin. Perhaps people expected too much from this film and had too much faith in Ridley Scott and Russell Crowe, but the film in several aspects. First of all, there was not enough emotion. Despite the fact that everyone knows the story of Robin Hood, a movie can do well regardless of that if they play with the spectator’s emotions. This film did not do that. There was scarce humour in the film, and the only characters capable of supplying it were Will Scarlett (Scott Grimes) and Little John (Kevin Durand). There was obviously no terror in the film, anticipation or sadness (only with the death of Sir Walter Locksley). Even though I do not usually consider love to be a key element in films, Robin Hood even failed in that aspect. The love story between Lady Marion and Robin is cold, with very little chemistry or development, and saving one scene where Robin cockily teases her, there is little emotion between them and hence little believability when Robin turns to her during the end of the film and, almost in a forced manner, tells her that he loves her. It is hard to find who to blame for this lack of depth in their characters. Surely one cannot doubt in the talents of Russell Crowe and Cate Blanchett, and Scott has proved many times that he is a endowed director. However, I believe the blame may lie in the fact that the film must have been very poorly edited. The movie itself seems rough and incoherent with abrupt transitions and little character depth. With the film already being more than two hours long, it looks like several scenes must have been cut out, and whilst I do not miss not having seen Lady Marion and Robin’s love unfold, I do wish I had been able to see more into Robin’s character. Talking about characters, there is too little time to get to make a real opinion on anyone in this film. Perhaps the most interesting personality is the two-timing Godfrey (Mark Strong) and a convincingly treacherous Prince John (Oscar Isaac). Cate Blanchett is quite bland as Lady Marion. She does not portray too many emotions, and fails to convince the viewer that she actually has any feelings for Robin in the end. As has also happened in films like Lord of the Rings, it looks necessary to ensure that women also turn into warriors and soldiers and fight in order to get rid of that long term image of female fragility, yet again though, Cate Blanchett looks naff as a warrior too. Some other characters act a reasonable role but are not given enough screen time, and other characters don’t seem to evolve or appear more interesting. Worthy actors such as Scott Grimes, who excelled in the HBO series Band of Brothers, or the chameleonic Kevin Durand, perhaps best known for his roles as Martin Keamy in Lost, the Blob in X-Men Origins: Wolverine, or Ashton Kutscher’s God fearing Chicano cellmate in The Butterfly Effect, get very little screentime, and Max Von Sydow, of The Exorcist or Flash Gordon fame often resembles Richard Harris’ portrayal of Marcus Aurelius in Gladiator. As for the Sheriff Nottingham, for whom the film was originally made for, Matthew MacFadyen does what he can, but the role is feeble as the Sheriff is depicted as a flimsy, cowardly, sleazy incompetent. Friar Tuck, played by Mark Addy, barely appears, yet considering that this is a supposed pre-introduction into Robin Hood’s tales, this could be excused, as it may be supposed that the Friar becomes an acquaintance at a further stage in time. Additionally, even though this production has not included added fictional characters, such as the charismatic Azeem, or the unbelievable witch of Nottingham that appeared in Robin Hood: Prince of Thieves, the ones who are included fail to deliver. Mark Streitenfeld proves that he has learnt well from his master Hans Zimmer and delivers a soundtrack that adapts well to the movie. However, like everything in this production, it is clearly second-best, and in no moment does he deliver a piece of music that can rival Zimmer’s work in Gladiator or recent productions. If this could be considered a form of Robin Begins, in comparison to Christopher Nolan’s first Batman film, it certainly fails to deliver. In a story where everybody knows who the hero is, the lady and the villain, there should be some more depth invested into the characters to produce something new. 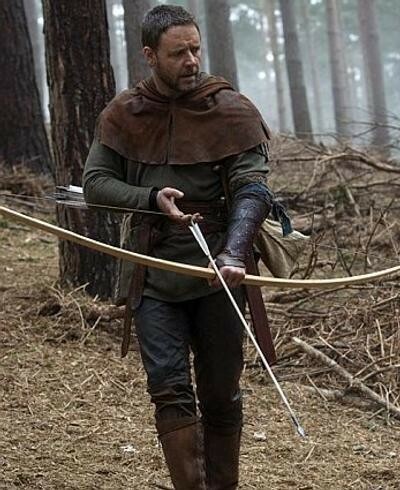 Credit where it is due, this is a new look on how Robin Hood became who he was, even though the film obviously has as much fantasy as it does history. However, when watching the movie trailer one can mainly see action, gore and fights, and that is pretty much what this film is about. Perhaps it should have been longer, perhaps the whole plot in itself was rushed and not meticulous enough, or maybe, after seeing how well known characters like Batman and James Bond have become darker, more perturbed and have opened themselves psychologically and mentally, one almost hoped that Robin Hood would do the same. Regardless of this, the film is entertaining, and the viewer certainly doesn’t feel like they have wasted their money, but equally, they do not leave the theatre fully satisfied and when they ask their company whether they enjoyed film, the answer, from what I have witnessed, is usually a shoulder shrug. A decent film to invest a few hours, but don’t expect yourself to watching Robin Hood on DVD when it is released. More than a classic, this film can be considered one of those anticipated movies that entertain, but fail to enthral, (Troy comes to mind),and after Ridley Scott’s Roman masterpiece, it is apparent that he simply cannot surpass his creation, and like Kingdom of Heaven or Chicken McNuggets, the film almost satisfies, but certainly doesn’t fill you, and is just another Robin Hood movie, only without the laughter that the humorous Mel Brooks flick Robin Hood: Men in Tights provided, the charm of Errol Flynn’s The Adventures of Robin Hood; the magic of Disney’s version or the wit and absurdity of Kevin Reynolds’s Prince of Thieves. Instead, the charm has been replaced by supposed realism and gore and swords with too little character development and bow and arrows.